Development market, as in most, there are incredible similarities and strange happenstance where the lines seemingly cross without much of a thought. Though in one realm people are representing their countries and battling in beloved sports, and the other, we’re just trying to learn better and convince people along the way that they can too. Admit it, you were waiting for me to get to this point. The Olympic Games as they are known are a tremendous time to capitalize on action-oriented content. People are fixated with medal counts and want to know how their country is doing at all times, including intrigue in sports that they have never once given consideration to. To be clear, I’m not suggesting that you conduct an office-wide gymnastics, volleyball or wrestling competition. Merely, that at this particular time in history, people are highly motivated to think introspectively. Thoughts like, “If I would have kept with that sport in high school… Would I have gotten to this point?” or “What am I going to do with this new found knowledge of the complexities of Table tennis?” are running rampant in your workplace. This leads us to an intriguing opportunity for the content creators out there. Topical games are an underutilized facet of the educational mix, though their longevity is questionable, their existence could easily generate motivation the likes of which your organization has yet to experience. If a big swimming event is occurring next week and it is going to be in the hearts and minds of your employees, why not place a game in front of them that allows them to expand on their learnings while advancing their avatars across a cartoony swimming pool? Speaking of medal counts, Bronze, Silver, and Gold medals are quite literally the badging standard. Why not create badges that match your gamification efforts? By giving a time window reflecting the duration of the games themselves, you could ward off office distractions, and obtain a level of focus an organization typically does not experience at this time of a 4-year cycle. Instead of hearing about who won Judo, Equestrian, team handball, and rowing; we could be motivating our learners to participate in their own way. Statements like, “Did you see John in Human Resources has 35 Gold Medals?” could very well be an interesting change of pace that not only brings your smart and topical learning environment into the limelight, but also provides an increase in productivity for your program. With so much focus on National pride and reaching collective success as a team, another manner you could reach your team is by using this time to becoming more team focused. It is only natural for people to chatter about the events that are transpiring on the World’s stage in Rio; at the same time, they’re talking, and while they’re talking they are presenting a strong ability to collaborate on tasks. 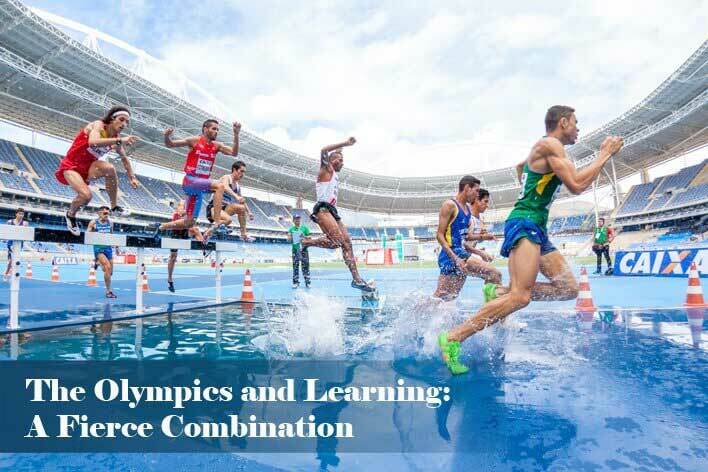 Embrace the Olympic culture, and suggest collaborative work groups up and down your organization. Take advantage of inter-company social media representation and allow people to use this time in order to further build their connections. People, in general, are already invested in their work, but if you take a look around the office, you will be surprised to find that some of your hardest workers are giving their work just a little bit more during these events. Above all, people are very proud of their Countries and when that particular emotion is presenting itself, it tends to permeate into other facets of work. Embrace the Summer Olympics as they are a truly unique commodity that only present themselves every 4 years, and to use a dated expression, “Strike while the iron is hot!” That Trampoline event may not make sense to you, but there are undoubtedly people in your organization who perceive what is going on in that sport as a dream come true and its representation as a victory in and of itself. Do not be afraid to nurture these thought processes. Get out ahead of it and consider sending a quick company-wide synopsis of events from the previous day; this will promote positive communication channels within your organization and allow for the Learning environment mentioned above. When coupling all of these methodologies together keep in mind that we do not want to go overboard. Instead, we are finding a unique way to cultivate the motivation of our staff, by presenting them with items that are coinciding directly with how they are thinking t this current moment in time. Though your entire office may not be interested in all of the events, and some people may be disinterested altogether, the sheer anticipated volume of eyes set to watch the events themselves should be an indication of what a colossal opportunity this could be. Thank you for joining me for this fun venture into a current event that will unquestionably affect our work week in one way or another and please continue looking towards the bright side and the potential of what these cool current events could mean to yourself and your organization.